I've never been a big Earl Weaver fan. This makes me so, so happy that you watched the game and weighed in with comments. Thank you. That peppy NBC Sports opening theme just means happy anticipation and excitement to me. I can almost smell the Brut, Old Spice, coffee and cigarettes when I see Curt Gowdy and Chuck Thompson. I've started wearing Brut and Old Spice again in the last few months, and I've always been a big coffee drinker. If I make it to 80 or 85 or so, I might well go ahead and start smoking. I have to say watching this I don't miss constantly hearing about pitch count. 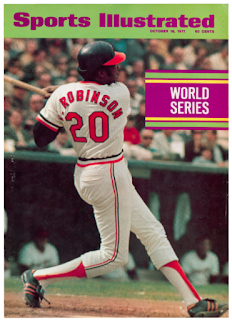 I was reading some stuff in one of the newspapers or SI or somewhere in the early part of this series when Brooks Robinson was talking about how nervous he used to get in big-hit situations. But he talked about how he had come through with some clutch hits for the Orioles in the past, and he just wasn't that worried this time that it might not work out. That's the sort of thing that would get harped on and distorted and dissected and clobbered today, and I don't miss any of that in this 1971 coverage. I think it's the right attitude for a lot of jobs and/or a lot of individuals. I know that I've actually gotten better at my job and more productive since I've started admitting to myself in tough situations that failure is absolutely an option. Does not work for my wife, however. She goes the other way on that. Cuellar retired the first 11 batters. Not to big time you boys, but, for the sake of full disclosure, I guess it's time for Mr. Big Time to note that I have actually met and interviewed Mike Cuellar! I've also met and interviewed a president of Iceland, so, you know ... boom. Eat that. As noted on "Twenty Fourth Podcast," I am very interested to see how Earl Weaver's grand Merv Rettenmund experiment in Game 7 works out. And I at at the ready to harp on, distort and dissect and clobber if I get the slightest bit of data to confirm my theory that benching All-Star center-fielder Paul Blair was a grave mistake. My word, is the Chuck Thompson nationally televised tribute to the outgoing, college-bound Baltimore bat boy not the sweetest thing in the world? I love it that he cites even the Pirates' feelings that he does an excellent job. Boog Powell is a sight to behold. I wonder if Heath started doing those white-leather-sleeved, black-wool-chested letterman's jackets after Coach Noles or whoever saw how great Danny Murtaugh looked at the MLB71 World Series. Rettenmund grounds to the shortstop in the second. Here's a piece of Bob Hurte's article on Steve Blass for the Society for American Baseball Research: "Steve Blass was born on April 18, 1942, in the rural town of Canaan, Connecticut. He was the son of a plumber. The Blass homestead included a barn with an interestingly angled roof, against which a young Steve would play hundreds of one-man games with a tennis ball. 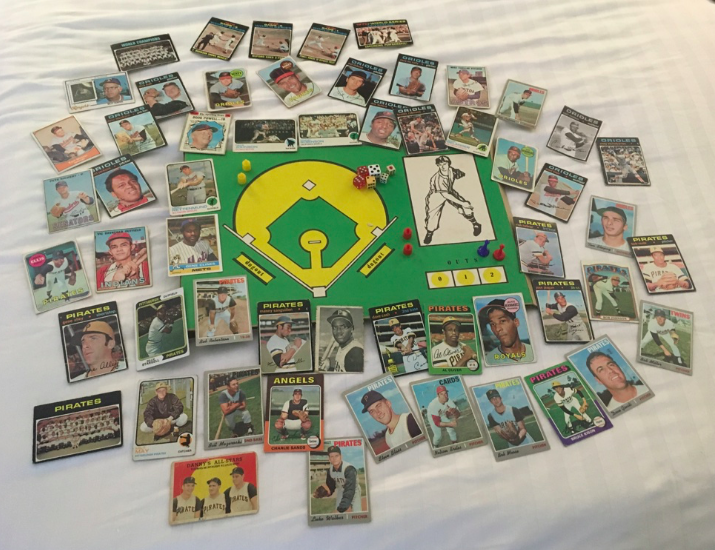 'I had all kinds of games, with different, very complicated ground rules. I'd throw the ball up and then dive into the weeds for pop ups or running back and calling for long fly balls and all. I'd always play a full game. A made-up game, with two major league teams and I would write down the line score as I went along and keep the results. One of the teams had to be the Indians. I was a total Indians fan, completely buggy. 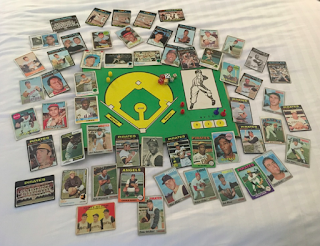 In the summer of 1954, when they won the record of one hundred and eleven games, I managed to find every single Indian box score in the newspaper and clip it out, which took some doing up where we lived.'" The SABR bios are invariably fantastic. Ooooh, AFC intra-divisional intrigue after the World Series on NBC: Browns at Bengals or Chargers at Broncos (check your local listings)! Sweet-talker Curt Gowdy, you slay me. Scoreless through three innings ... final out of the Baltimore home half is a hot grounder down the third-base line, gobbled up by Jose Pagan. Murtaugh has been going back and forth in this series between veteran-glove-guy Pagan and young-slugger Richie Hebner at third base, and Murtaugh erred on the side of defense in Game 7. And, to repeat (just in case I've been too subtle), Earl Weaver decided to favor offense in playing Rettenmund ahead of Blair, who in MLB71 for the third-straight time has won the American League Gold Glove for center field. Do you see what I'm getting at here? Do you get it? Is there any talk of the Nationals replacing Dusty Baker with Davey Johnson as manager? Or is Davey Johnson now 95 years old? There goes Clemente ... home run. Jeez. He stance is so compact and modest, and then his swing is just an explosion. The radio guys have been saying that Clemente has hit safely in every World Series game of his career. No, it turns out that Merv dribbles a bouncer into the infield, and who's there for the scoop and throw out? Why, it's none other than Jose Pagan. Elrod Hendricks challenges Blass and the Pirates with a one-out double blasted to right-center in the bottom of the fifth. Clemente can't get to it, but center-fielder Gene Clines is there with the backup and holds Hendricks to second with quite a strong, off-balance throw from the warning track. Then Mark Belanger flies to center, and Clines guns to third--and Hendricks stays at second. Blass strikes out my old personal friend, Mike Cuellar, to finish the fifth. Gowdy confirms the Clemente-hit-in-every-World Series-game deal: hits in all seven MLB60 World Series games and now hits in all seven MLB71 series games. To lead off the seventh, however, he flies out. To Rettenmund. Top of the 8th, Stargell gets a single to start it off. Only the third hit of the game for the Pirates up to this point. Pagan then hits a double to center. Stargell is waved home as he was running on the pitch. Powell cuts off the throw into the plate. The throw may have gotten Stargell out, but he scores. 2-0 Pittsburgh. That single by Stargell went under Belanger's glove. One of the things that the radio guys were saying early in the series was not that Baltimore's defense had been bad but that it had not been flawless. The Orioles' defense, indeed, is roundly hailed as baseball's best in the stuff I look at it in this timeframe. I think even Brooks Robinson has had a couple of errors in this World Series. That hit by Pagan that scored Stargell was to center. Rettenmund bobbled it. I wonder if Paul Blair was sitting next to Earl Weaver in the dugout. Interesting. 2-0 Pittsburgh leads with 1 out and a man on second in the top of the 8th and they let their pitcher bat. That is interesting. And the Pirates have the National League's leader in saves in MLB71, Dave Giusti. Oooooh, as we wait for Dave Cash to come up with two out in the top of the eighth, Curt Gowdy reports, "The Magic Kingdom of Walt Disney’s world comes to life with help from Julie Andrews, Jonathan Winters, Glen Campbell and Bob Hope in a very special special on Friday night, Oct. 29, right here on NBC!" That sounds fantastic. Hendricks opens the bottom of the 8th with a single up the middle. Belanger follows with a single up the middle to put men on first and second no out the pitcher due up. Phew. I wonder if Dave Giusti is sitting next to Danny Murtaugh in the Pirate dugout. Tom Shopay comes in to pinch hit. He bunts the runners forward. So now we have 2nd and 3rd, 1 out and Buford coming up who has been trouble so far for Steve Blass. Indeed, Giusti is up throwing in the Pittsburgh bullpen. I've played with Dave Giusti baseball cards since 1975, and, all of this time, I thought his last name was pronounced, "gusty." It's not. It's pronounced, "justy." Buford hits a grounder to 1st he's out but runners advance, 2-1 Pittsburgh. I just want to say that my dear, old friend, Mike Cuellar, pitched well in this game. MLB18 Washington Nationals manager Davey Johnson grounds out to end the eighth. After Tony Kubek's grandstand interview with the U.S. secretary of state and as we wait for Gene Clines to lead off the top of the ninth, Curt Gowdy kills me softly with this love: "The Miami Dolphins today murdered the New England Patriots today, 41 to 3." One out, and here's Roberto Clemente, with a chance to tie the major-league record for most hits (13) in a single World Series. Gowdy: “Ball 2 to Clemente … He’s had 11 years between World Series, and he’s made them count. At the age of 37, he has burning pride. He wanted to have a great series, and he has … Three balls and no strikes to Clemente … There’s a strike to him, three and one … The way he’s played here, and you take a look at that body and see the way he still throws and runs, he could play for another two or three years at least, unless he gets some hard-luck injuries ..."
Rest in peace, Roberto Clemente of Carolina, Puerto Rico (1934-1972). Bottom of the 9th and Blass will face Boog Powell, Frank Robinson, and Merv Rettenmund. Powell grounds out. Robinson pops out. Rettenmund grounds out, Pirates win. Hmmm ... interesting that Rettenmund made the final out. Well, that was a lot of fun. Thank you, Pirates, Orioles, NBC, Curt Gowdy, Chuck Thompson and YouTube user Newton Minnow. What started out as a jubilant Downtown celebration to welcome the triumphant World Series-winning Pirates turned into a spree of crime and vandalism last night. Store fronts were smashed and some businesses were looted by the predominantly young crowd—many of them swigging beer and hard liquor. At least three taxicabs were overturned; scattered fire broke out and police reported a dozen rapes. But there was no response from the players, who sat quietly in front of their open lockers. Plastic curtains, which would have been used to protect clothing in a clubhouse celebration, remained atop the lockers. Ed: No we can’t. First they’ve got to win the division crown which they haven’t in 38 years to qualify for the Super Bowl. Off their showing Monday night against the Kansas City Chiefs there won’t be any celebration for them for another year … if then. I should've noted that the NBA-highlights video in this post covers the 1971-72 season, so there are some giant spoilers in there. If you want to pretend you don't know how that season is going to come out and just want to prepare to follow it along with me, then here's the 1970-71 season review that you're looking for. Here and here are how the NBA came out last year, and here, the ABA. The AP reported this week that the major bowls, ABC and NCAA were going to meet in Chicago to work on a championship game. Did I not write about the Cowboys' Monday-night win over the Giants in Week 4? Apparently not. I must've watched it when I was trying to boycott the NFL because of Kaepernick and when I was not boycotting the NFL because of Kaepernick. Well, anyway, the Cowboys looked great in beating the Giants--Duane Thomas had returned to active duty, and he looked extra lively (if fumbly). But, anyway, Dallas is really flaky, and, the next week, the Cowboys lost to the Saints (! ), 24-14. In other Week 5 action, the Colts, Dolphins (as previously reported), Redskins, Lions, Rams, Vikings, Browns, Raiders and Chiefs all looked strong. Buffalo is at San Diego on Saturday night, Oct. 23 (it does not appear to be on TV). The big games are Sunday are Bengals at Raiders, Bears at Lions and Redskins at Chiefs. Monday night is Colts at Vikings--I'm really excited about that one. The winless Eagles have a new coach, Ed Khayat, and he reportedly doesn't allow his players to wear mustaches. "Revenge time against the Jets" in Week 6: Miami 30, New York 14. Here's an interesting fact about the four-year-old "Super Bowl" era: Never has the team that lost the AFL-NFL/AFC-NFC championship returned to the title game, and only twice in four years has the runner-up even qualified for the playoffs the following year. Indeed, it has been a chaotic NFL71 so far for the Super Bowl IV-losing Cowboys, but maybe Dallas has steadied for smooth sailing. In the first-ever game at "Texas Stadium," Duane Thomas ripped off about nine yards per run; Coach Tom Landry appeared to have finally settled on one quarterback in Roger Staubach, and the defense neutralized star-rookie Jim Plunkett and the Patriots. Dallas opened a 37-7 lead and beat the Patriots, 44-21, to improve to 4-2. As previously reported, the Chiefs came from behind to beat the Redskins, 27-20, so, once again, no professional-football team is going to finish the season undefeated. It sure would be impressive if that ever happens; in fact, I don't see any way that you could consider a team that went through the whole season undefeated as anything but the greatest team of all time. Also on Sunday, Oct. 24, per Howard Cosell on Monday, Oct. 25: Oakland 31, Cincinnati 27 (but Bengals rookie Kenny Anderson looks great) ... Broncos 27, Browns 0 (Nick Skorich is still wearing the beanie) ... Bears 28, Lions 23 (my oldest brother says Bobby Douglass was the worst quarterback he ever saw in the NFL, but he looks pretty good in these clips). Two 1971 months until Christmas71. In other, non-Cosell-ed Week 6 NFL71 action, it was Pittsburgh over Houston, 23-16; Atlanta over New Orleans, 20-6; Philadelphia over the Giants, 23-7; San Francisco over St. Louis, 26-14; Los Angeles over Green Bay, 30-13. San Diego whipped Buffalo, 20-3, in that Saturday-night game. And the Monday-night result, as reported in the future, is Minnesota 10 over Baltimore 3. What a terrific #freakinweekend at the HP.